<2nd trip> The “trip” in the “Two Trip Detection Logic” means a driving mode in which self-diagnosis is performed during vehicle operation. Specific on board diagnostic items will cause the ECM to illuminate or blink the MIL, and store DTC and Freeze Frame data, even in the 1st trip, as shown below. For malfunctions in which 1st trip DTCs are displayed, refer to EC-93, "DTC Index". These items are required by legal regulations to continuously monitor the system/component. In addition, the items monitored non-continuously are also displayed on CONSULT. When a 1st trip DTC is detected, check, print out or write down and erase (1st trip) DTC and Freeze Frame data as specified in Work Flow procedure Step 2, refer to EC-127, "Work Flow". Then perform DTC Confirmation Procedure or Component Function Check to try to duplicate the malfunction. If the malfunction is duplicated, the item requires repair. The DTC and the freeze frame data will be stored until the vehicle is driven 40 times (driving pattern A) without the same malfunction recurring (except for Misfire and Fuel Injection System). For Misfire and Fuel Injection System, the DTC and freeze frame data will be stored until the vehicle is driven 80 times (driving pattern C) without the same malfunction recurring. The “TIME” in “SELF-DIAGNOSTIC RESULTS” mode of CONSULT will count the number of times the vehicle is driven. For details about patterns B and C under “Fuel Injection System” and “Misfire”, see “EXPLANATION FOR DRIVING PATTERNS FOR “MISFIRE <EXHAUST QUALITY DETERIORATION>”, “FUEL INJECTION SYSTEM”. For details about patterns A and B under Other, see “EXPLANATION FOR DRIVING PATTERNS FOR “MISFIRE <EXHAUST QUALITY DETERIORATION>”, “FUEL INJECTION SYSTEM”. *1: When the same malfunction is detected in two consecutive trips, MIL will light up. *2: MIL will turn OFF after vehicle is driven 3 times (pattern B) without any malfunctions. *3: When the same malfunction is detected in two consecutive trips, the DTC and the freeze frame data will be stored in ECM. *5: When a malfunction is detected for the first time, the 1st trip DTC and the 1st trip freeze frame data will be stored in ECM. *6: The 1st trip DTC and the 1st trip freeze frame data will be cleared at the moment OK is detected. *7: When the same malfunction is detected in the 2nd trip, the 1st trip freeze frame data will be cleared. *8: 1st trip DTC will be cleared when vehicle is driven once (pattern C) without the same malfunction after DTC is stored in ECM. Refer to EC-61, "DIAGNOSIS DESCRIPTION : Driving Pattern". *4: The DTC and the freeze frame data will not be displayed any longer after vehicle is driven 40 times (pattern A) without the same malfunction. e data will be stored in ECM. *6: 1st trip DTC will be cleared after vehicle is driven once (pattern B) without the same malfunction. CAUTION: Always drive at a safe speed. Engine coolant temperature rises by 20°C (36°F) or more after starting the engine. Engine coolant temperature reaches 70°C (158°F) or more. Vehicle speed of 70 – 120 km/h (44 – 75 MPH) is maintained for 60 seconds or more under the control of closed loop. Vehicle speed of 30 – 60 km/h (19 – 37 MPH) is maintained for 10 seconds or more under the control of closed loop. When the freeze frame data shows lower than 70°C (158°F), engine coolant temperature should be lower than 70°C (158°F). When the freeze frame data shows higher than or equal to 70°C (158°F), engine coolant temperature should be higher than or equal to 70°C (158°F). Driving pattern D means a trip satisfying the following conditions. System Readiness Test (SRT) code is specified in Service $01 of SAE J1979/ISO 15031-5. As part of an enhanced emissions test for Inspection & Maintenance (I/M), certain states require the status of SRT be used to indicate whether the ECM has completed self-diagnosis of major emission systems and components. Completion must be verified in order for the emissions inspection to proceed. If a vehicle is rejected for a State emissions inspection due to one or more SRT items indicating “INCMP”, use the information in this Service Manual to set the SRT to “CMPLT”. In most cases the ECM will automatically complete its self-diagnosis cycle during normal usage, and the SRT status will indicate “CMPLT” for each application system. Once set as “CMPLT”, the SRT status remains “CMPLT” until the self-diagnosis memory is erased. Occasionally, certain portions of the self-diagnostic test may not be completed as a result of the customer's normal driving pattern; the SRT will indicate “INCMP” for these items. NOTE: The SRT will also indicate “INCMP” if the self-diagnosis memory is erased for any reason or if the ECM memory power supply is interrupted for several hours. If, during the state emissions inspection, the SRT indicates “CMPLT” for all test items, the inspector will continue with the emissions test. However, if the SRT indicates “INCMP” for one or more of the SRT items the vehicle is returned to the customer untested. NOTE: If permanent DTC is stored or MIL illuminates during the state emissions inspection, the vehicle is also returned to the customer untested even though the SRT indicates “CMPLT” for all test items. therefore, it is important to check SRT (“CMPLT”), DTC (No DTCs) and permanent DTC (No permanent DTC) before the inspection. SRT is set as “CMPLT” after self-diagnosis has been performed one or more times. Completion of SRT is done regardless of whether the result is OK or NG. The set timing is different between OK and NG results and is shown in the table below. OK: Self-diagnosis is carried out and the result is OK.
NG: Self-diagnosis is carried out and the result is NG. —: Self-diagnosis is not carried out. The SRT will indicate “CMPLT” at the time the respective self-diagnoses have one (1) OK result. The emissions inspection requires “CMPLT” of the SRT only with OK self-diagnosis results. 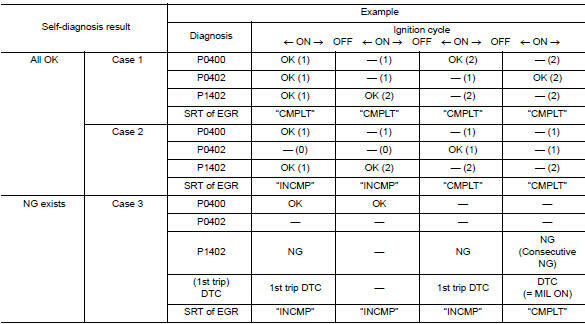 During SRT driving pattern, the 1st trip DTC (NG) is detected prior to “CMPLT” of SRT and the self-diagnosis memory must be erased from the ECM after repair. If the 1st trip DTC is erased, all the SRT will indicate “INCMP”. NOTE: SRT can be set as “CMPLT” together with the DTC(s). Therefore, DTC check must always be carried out prior to the state emission inspection even though the SRT indicates “CMPLT”. NOTE: Check the MIL circuit if MIL does not illuminate. Refer to EC- 476, "Diagnosis Procedure". NOTE: If MIL continues to illuminate/blink, perform self-diagnoses and inspect/repair accordingly because an emission-related ECU has detected a malfunction in the emission control systems components and/or the powertrain control components (which affect vehicle emissions). Accelerator pedal released position learning ECM can learn the accelerator pedal released position. Refer to EC-139, "Work Procedure". Throttle valve closed position learning ECM can learn the throttle valve closed position. Refer to EC-140, "Work Procedure". Idle air volume learning ECM can learn the idle air volume. Refer to EC-141, "Work Procedure". Mixture ratio self-learning value clear Mixture ratio self-learning value can be erased. Refer to EC-143, "Work Procedure". If it remains OFF, check MIL circuit. Refer to EC-476, "Diagnosis Procedure". This function allows to read if ECM has completed the self-diagnoses of major emission control systems and components. For SRT, refer to EC-62, "DIAGNOSIS DESCRIPTION : System Readiness Test (SRT) Code". After ignition switch is turned off, ECM is always released from the “self-diagnostic results” mode. NOTE: Do not release the accelerator pedal for 10 seconds if MIL starts blinking during this period. This blinking is displaying SRT status and is continued for another 10 seconds. ECM has entered to “Self-diagnostic results” mode. NOTE: Wait until the same DTC (or 1st trip DTC) appears to completely confirm all DTCs. Refer to EC-93, "DTC Index". How to Erase Self-diagnostic Results By performing this procedure, ECM memory is erased and the following diagnostic information is erased as well. Set ECM in “self-diagnostic results” mode. Data Monitor Input/Output data in the ECM can be read. Work support This mode enables a technician to adjust some devices faster and more accurately by following the indications on the CONSULT screen. Active Test Diagnostic Test Mode in which CONSULT drives some actuators apart from the ECMs and also shifts some parameters in a specified range. ECU Identification ECM part number can be read. DTC Work Support The status of system monitoring tests and the self-diagnosis status/results can be confirmed. *: The following emission-related diagnostic information is cleared when the ECM memory is erased. DTCs and 1st trip DTCs related to the malfunction are displayed in “self-diag results”. When ECM detects a 1st trip DTC, 1t” is displayed for “TIME”. When ECM has detected a current DTC, “0” is displayed for “TIME”. If “TIME” is neither “0” nor “1t”, the DTC occurred in the past and ECM shows the number of times the vehicle has been driven since the last detection of the DTC. NOTE: If the ignition switch stays ON after repair work, be sure to turn ignition switch OFF once. Wait at least 10 seconds and then turn it ON (engine stopped) again. “Fuel injection system status” at the moment a malfunction is detected is displayed. One of the following mode is displayed. The calculated load value at the moment a malfunction is detected is displayed. The engine coolant temperature at the moment a malfunction is detected is displayed. “Long-term fuel trim” at the moment a malfunction is detected is displayed. The long-term fuel trim indicates much more gradual feedback compensation to the base fuel schedule than short-term fuel trim. “Short-term fuel trim” at the moment a malfunction is detected is displayed. The short-term fuel trim indicates dynamic or instantaneous feedback compensation to the base fuel schedule. The engine speed at the moment a malfunction is detected is displayed. The vehicle speed at the moment a malfunction is detected is displayed. The throttle valve opening angle at the moment a malfunction is detected is displayed. The base fuel schedule at the moment a malfunction is detected is displayed. The intake air temperature at the moment a malfunction is detected is displayed. There items are displayed but are not applicable to this model. *: The items are the same as those of 1st trip freeze frame data. Indicates the engine speed computed from the signal of the crankshaft position sensor (POS) and camshaft position sensor (PHASE). Accuracy becomes poor if engine speed drops below the idle rpm. If the signal is interrupted while the engine is running, an abnormal value may be indicated. “Base fuel schedule” indicates the fuel injection pulse width programmed into ECM, prior to any learned on board correction. When engine is running, specification range is indicated in “SPEC”. The mean value of the air-fuel ratio feedback correction factor per cycle is indicated. 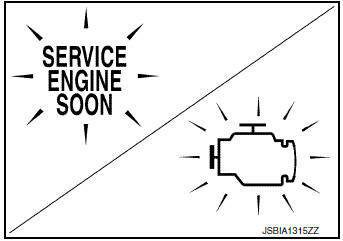 When the engine is stopped, a certain value is indicated. This data also includes the data for the air-fuel ratio learning control. When the engine coolant temperature sensor is open or short-circuited, ECM enters fail-safe mode. The engine coolant temperature determined by the ECM is displayed. The A/F signal computed from the input signal of the air fuel ratio (A/F) sensor 1 is displayed. The signal voltage of the heated oxygen sensor 2 is displayed. Display of heated oxygen sensor 2 signal. RICH: means the amount of oxygen after three way catalyst is relatively small. LEAN: means the amount of oxygen after three way catalyst is relatively large. The power supply voltage of ECM is displayed. The accelerator pedal position sensor signal voltage is displayed. ACCEL SEN 2 signal is converted by ECM internally. Thus, it differs from ECM terminal voltage signal. The throttle position sensor signal voltage is displayed. TP SEN 2-B1 signal is converted by ECM internally. Thus, it differs from ECM terminal voltage signal. The fuel temperature (determined by the signal voltage of the fuel tank temperature sensor) is displayed. The signal voltage of EVAP control system pressure sensor is displayed. The signal voltage of the fuel level sensor is displayed. Indicates start signal status [ON/OFF] computed by the ECM according to the signals of engine speed and battery voltage. After starting the engine, [OFF] is displayed regardless of the starter signal. Indicates idle position [ON/OFF] computed by ECM according to the accelerator pedal position sensor signal. Indicates [ON/OFF] condition of the air conditioner switch as determined by the air conditioner signal. [ON/OFF] condition of the power steering system (determined by the signal sent from EPS control unit) is indicated. Indicates [ON/OFF] condition from the electrical load signal. On: Rear window defogger switch is ON and/or lighting switch is in 2nd position. Off: Both rear window defogger switch and lighting switch are OFF. Indicates [ON/OFF] condition from ignition switch signal. Indicates [ON/OFF] condition from the heater fan switch signal. Indicates [ON/OFF] condition from the stop lamp switch signal. Indicates the actual fuel injection pulse width compensated by ECM according to the input signals. When the engine is stopped, a certain computed value is indicated. Indicates the ignition timing computed by ECM according to the input signals. “Calculated load value” indicates the value of the current air flow divided by peak air flow. Indicates the mass air flow computed by ECM according to the signal voltage of the mass air flow sensor. The opening becomes larger as the value increases. Indicates [°CA] of intake camshaft advance angle. Indicates [°CA] of exhaust camshaft advance angle. The control value of the intake valve timing control solenoid valve (determined by ECM according to the input signals) is indicated. The advance angle becomes larger as the value increases. The control condition of the intake manifold runner control valve (determined by ECM according to the input signals) is indicated. The air conditioner relay control condition (determined by ECM according to the input signals) is indicated. Indicates the fuel pump relay control condition determined by ECM according to the input signals. The control condition of the EVAP canister vent control valve (determined by ECM according to the input signals) is indicated. Indicates the throttle control motor relay control condition determined by the ECM according to the input signals. Indicates the condition of the cooling fan (determined by ECM according to the input signals). Indicates [ON/OFF] condition of heated oxygen sensor 2 heater determined by ECM according to the input signals. Indicates the engine speed computed from the input speed sensor signal. The vehicle speed computed from the vehicle speed signal sent from TCM is displayed. YET: Idle air volume learning has not been performed yet. CMPLT: Idle air volume learning has already been performed successfully. Distance traveled while MIL is activated. The engine oil temperature (determined by the signal voltage of the engine oil temperature sensor) is displayed. Air fuel ratio (A/F) sensor 1 heater control value computed by ECM according to the input signals. The current flow to the heater becomes larger as the value increases. The preset vehicle speed is displayed. Indicates [ON/OFF] condition from MAIN switch signal. Indicates [ON/OFF] condition from CANCEL switch signal. Indicates [ON/OFF] condition from RESUME/ ACCELERATE switch signal. Indicates [ON/OFF] condition from SET/ COAST switch signal. Indicates [ON/OFF] condition from brake pedal position switch signal. Indicates [ON/OFF] condition of stop lamp switch signal. Indicates the vehicle cruise condition. Non: Vehicle speed is maintained at the ASCD set speed. Cut: Vehicle speed decreased to excessively low, and ASCD operation is cut off. Indicates [ON/OFF] condition of CVT O/ D according to the input signal from the TCM. Indicates [ON/OFF] condition of CVT O/ D cancel request signal. Indicates [ON/OFF] condition of CRUISE lamp determined by the ECM according to the input signals. Indicates [ON/OFF] condition of SET lamp determined by the ECM according to the input signals. Indicates the correction of factor stored in ECM. The factor is calculated from the difference between the target air-fuel ratio stored in ECM and the air-fuel ratio calculated from A/F sensor 1 signal. The intake manifold runner control valve position sensor signal voltage is displayed. Indicates [ON/OFF] condition from the park/neutral position (PNP) signal. The intake air temperature (determined by the signal voltage of the intake air temperature sensor) is indicated. The signal voltage from the refrigerant pressure sensor is displayed. The control value of the exhaust valve timing control solenoid valve (determined by ECM according to the input signals) is indicated. The signal voltage of engine oil pressure sensor is displayed. Indicates the condition of EVAP leak diagnosis. YET: EVAP leak diagnosis has not been performed yet. CMPLT: EVAP leak diagnosis has been performed successfully. Indicates the ready condition of EVAP leak diagnosis. ON: Diagnosis has been ready condition. OFF: Diagnosis has not been ready condition. Indicates DTC P015A or P015B self-diagnosis condition. Indicates DTC P014C or P014D self-diagnosis condition. Indicates DTC P014C, P014D, P015A or P015B self-diagnosis condition. ABSNT: The vehicle condition is not within the diagnosis range. PRSNT: The vehicle condition is within the diagnosis range. Indicates DTC P0139 self-diagnosis (delayed response) condition. Indicates DTC P0139 self-diagnosis (slow response) condition. Indicates DTC P117A self-diagnosis condition. The signal frequency of the mass air flow sensor is displayed. *: The item is indicated, but not used. NOTE: Any monitored item that does not match the vehicle being diagnosed is deleted from the display automatically. The idle air volume that keeps the engine within the specified range is memorized in ECM. EVAP SYSTEM CLOSE Close the EVAP canister vent control valve in order to make EVAP system close under the following conditions. Ambient temperature is above 0°C (32°F). Fuel tank temp is more than 0°C (32°F).